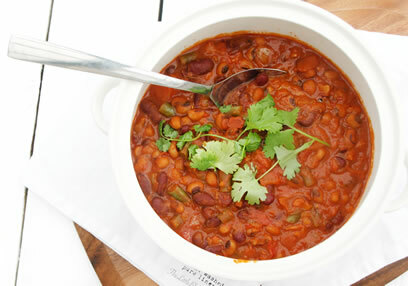 If using dried beans, soak overnight and cook the next day for around 1 hour! In a large wok, heat up the oil, and place in the onions. Cook them until they begin to turn golden in colour! Once the onions are a light brown, add in the chilli, ginger, garlic and salt. Let simmer and cook for 5 minutes. Keep the ingredients moving with a wooden spoon to prevent sticking! Add the tomato puree, cumin seeds & Tikka powder and stir. Add the black eyed beans, kidney beans, green beans and chopped tomato. Cover the wok with a lid and leave to simmer for 5-10 minutes. Once the beans have softened and the curry is bubbling, take off the lid and stir in the pea protein. Leave uncovered to simmer for a further 5-10 minutes. Once your delicious curry has fully cooked, remove the wok from the heat and serve while warm. Serve with some wholegrain rice, fresh coriander & homemade flatbread.